We’d love your help. Let us know what’s wrong with this preview of You're Safe With Me by Chitra Soundar. To ask other readers questions about You're Safe With Me, please sign up. To be fully appreciated this book must be read aloud, preferably with a little one on your lap. I loved the explanations the mama elephant gives and the reassurances she whispers, and the illustrations are like none other that I have seen. They are truly beautiful. This, at times overwhelming, beautiful picture book is so lovely, it is a perfect little book to help those who may be afraid of storms or bad weather. Really interesting and different, well worth a read just for the pleasure of seeing such intricate illustrations! Gorrrrrgeous. My son loves this one too. The page with the lightning is spectacular. On a dark and stormy night, the baby animals in the jungle are scared - of the wind huffing and puffing and blowing the trees, of the loud thunder claps, of the lightening that sparkles in the night sky, and of the water rushing in the river. Luckily for a little monkey, a baby loris, a tiger cub, and a young pangolin, a large, but gentle mama elephant comes along, and tenderly rocks them to sleep cradled in her truck. As she rocks them, she offers soothing words whenever the babies wake up whimp On a dark and stormy night, the baby animals in the jungle are scared - of the wind huffing and puffing and blowing the trees, of the loud thunder claps, of the lightening that sparkles in the night sky, and of the water rushing in the river. Luckily for a little monkey, a baby loris, a tiger cub, and a young pangolin, a large, but gentle mama elephant comes along, and tenderly rocks them to sleep cradled in her truck. As she rocks them, she offers soothing words whenever the babies wake up whimpering. Don't be scared, mama elephant tells them as she comforts with reasons why each scary naturally occurring stormy element is good for the jungle in which they all live. In calming, rhythmic language that reads like a lullaby, Chitra Soundar has written a beautiful, reassuring story that any parent or caretaker who has a fearful child will be grateful to have, especially on a dark and stormy night. I've actually had this book for a while, and have read and re-read it many time by myself and with kids. We all love the story, and have spent some time exploring the incredible illustrations by Poonam Mistry, done in one of the most unique styles I've ever seen in a picture book. She describes it as coming from her love of nature, and exploring the relationships between patterns, shapes, and color to create intricate illustrations, with a decidedly Indian influence. Mistry's digitally created images certainly reflect this philosophy. After you and your kids have read and enjoyed You're Safe With Me, be sure to visit Chitra Soundar's website where you can find related activities such as a crossword and word search puzzles, and a coloring page that looks suspiciously like the mama elephant in the story. While you're there, why not explore her other books for young readers. The publisher of You're Safe With Me, Lantana Publishing, is a relatively new independent publisher based in London. Their mission is to produce high quality, diverse books for kids and after having read many of them, I would say that they are indeed succeeding. All in all, I can say that You're Safe With Me is a wholly satisfactory reading experience and I highly recommend it. And if you like it as much as we did, you'll be happy to hear that there is a companion book called You're Snug With Me by both Chitra Soundar and Poonam Mistry due out October 1, 2018. Absolutely stunning art work with glowing colors and intricate designs! Opening each page was like unwrapping a jewel. Lovely lyrical text with many embedded sounds makes this a read-aloud delight. Perfect for bedtime stories and as a gorgeous example of books from other cultures. I'm on a mission to learn more about how the illustrations were created. The story is lovely: Mama Elephant soothes the baby animals back to bed, who are frightened by the sounds and lightning of a nighttime storm. I highly recommend this book for the illustrations as well. Poonam Mistry's use of color and design is amazing! -Sara Z. A beautiful, beautiful bedtime story to keep little ones from getting to scared of nature sounds. FABULOUS illustrations! Worth reading just for the illustrations, although the text is really nice, too. Great for a bedtime book. I was absolutely mesmerized by the frame-ready illustrations. I'd have been just as happy with this book if it was just illustrations alone. Unique, calming, surreal and dreamlike. 5 stars for the artwork. 3 stars for the text. Under the fall of darkness, the sounds and sights of the natural world become all the more frightening for the baby animals trying to sleep. Unsettled by the clattering of thunder and flickering of lightening, Mama Elephant reassures the young that the unnerving behaviour of the weather is happening for a reason, with a comforting story to explain the activity taking place beyond what the animals can see. Atmospheric and soothing, the intricate patterns and embellishments within the illustrati Under the fall of darkness, the sounds and sights of the natural world become all the more frightening for the baby animals trying to sleep. Unsettled by the clattering of thunder and flickering of lightening, Mama Elephant reassures the young that the unnerving behaviour of the weather is happening for a reason, with a comforting story to explain the activity taking place beyond what the animals can see. Atmospheric and soothing, the intricate patterns and embellishments within the illustrations are truly magical and draw the reader close to the page, immersing them in the beauty and the chaos of and Indian storm. I was particularly taken by the image of the lightning bolts spreading across the sky, with the unexpected change in the dispersion of the text drawing the eye unexpectedly in different directions across the page, perhaps mirroring that of the baby animals as they gaze into the night and the business of the storm. A lovely point for using drama to reinterpret and retell the story, particularly given the attention paid to the sounds emerging in the night. A captivating picture book that marries a lyrical and rhythmic story about bedtime fears with striking artwork inspired by Indian folklore. It is bedtime for the baby animals; the dark blanket sky is filled with an enormous moon and twinkling stars. But the comforting allure of night time soon gives way to fears when the winds rise and a thunder storm begins to set in. “You’re Safe With Me,” reassures Mama Elephant, as she explains the natural processes behind each stage of the storm, from the wa A captivating picture book that marries a lyrical and rhythmic story about bedtime fears with striking artwork inspired by Indian folklore. It is bedtime for the baby animals; the dark blanket sky is filled with an enormous moon and twinkling stars. But the comforting allure of night time soon gives way to fears when the winds rise and a thunder storm begins to set in. “You’re Safe With Me,” reassures Mama Elephant, as she explains the natural processes behind each stage of the storm, from the water raining down on the plants to make them grow to the clouds colliding to create crackling thunder. Through Mama Elephant’s storytelling and simple explanations, the animals are reassured in the knowledge that the noises and movements of the storm are natural processes and eventually feel safe to sleep soundly again. The lyrical narrative has a lullaby feel with its onomatopoeia and lilting rhythm, evoking the connection between the environment’s natural processes and the baby animals' instinctive sleep cycle. The text weaves its way beautifully through the distinctive artwork that embodies the sensuous and exotic jungle through a filter of earthy tones and an intricate pattern design inspired by traditional Indian prints. This is a beautiful story about feeling safe and about how gaining an understanding of the natural world can help to overcome fears, and it would make a lovely classroom library addition for EYFS and KS1. Told in a folklore-like style with repeating refrains and a firm story structure, this picture book carries the feeling of India with it. It carries a traditional feel, the warmth of Mama Elephant and the comfort she brings with her simple presence almost erases the storm. She uses the cycles of life, plant and animal, to reassure the little animals which makes for a rich story. The illustrations are amazing and also have a traditional feel to them. Filled with small dots, they are deep with spice and jungle colors. Their richness creates images that children will love to look at, discovering the animals almost hidden on the pages between the leaves of the forest. An impossibly beautiful lullaby story -- text and illustrations. At night, the baby animals are trying to go to sleep. However the night grows stormy, with the wind picking up, the thunder booming, the lightning flashing and the river gurgling as the rain fell. Each causes the little ones to give pause to their surroundings. Mama Elephant, who was just walking by, scoops them up in her trunk and reassures them that they are safe with her whenever they express fear, calming them down until they fi An impossibly beautiful lullaby story -- text and illustrations. 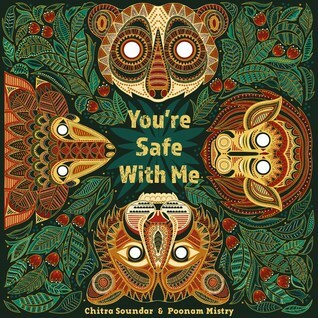 Soundar, Chitra You're Safe With Me, illustrated by Poonam Mistry, 32 pages. PICTURE BOOK Lantana Publishing, 2018. $18. The baby animals are afraid to go to sleep - the sounds of the jungle keep waking them. But when Mama Elephant comes and holds them in her trunk, she explains how all the sounds are really comforting. The illustrations are traditional and so detailed. This comforting bedtime story is perfect for a stormy night, and the illustrations are so intricate the book can be enjoyed slowly. So calming and sweet. Cross posted to http://kissthebook.blogspot.com CHECK IT OUT! The illustrations are GORGEOUS if not a bit overwhelming at times. Good weather/nature sounds are included in the text and reassuring Mama Elephant can be a great comfort for a kid who needs some reassurance or as a great way to wind down before bedtime. I wish there was a bit more of an ending though. Seemed a tad abrupt. 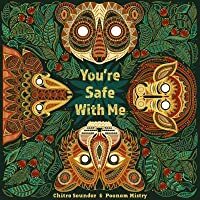 This week's book for Miss Carrie recommends is You're Safe With Me by Chitra Soundar and Poonam Mistry. It is a kaleidoscope of amazing colors and shapes! The story is simple, as it follows Mother Elephant as she calms her babies during a storm. However, it is the artwork that is the star of the show. Recommended for preschoolers and up. "When the moon rose high and the stars twinkled, it was bedtime for baby animals. But that night, when the skies turned dark and the night grew stormy, the little ones couldn't sleep." Intricate, dazzling illustrations and imaginative, calming text make this tale of maternal love a must-read at bedtime. A gorgeously illustrated Indian bedtime tale that invites lingering over the detailed artwork while absorbing the soothing sounds and rhythms of the text and it's calming whispered refrain from Mama Elephant: "You're safe with me." Thank you, Lerner, for distributing this treasure from Lantana Publishing, UK. Beautiful illustrations, like nothing I've seen before. They remind me of mandalas. I wonder if they might overwhelm some young eyes with their color and intricacy, but I haven't yet read the book with children to test this theory. The text makes for a comforting, Earth-friendly bedtime read. I like that the mother elephant is watching over a variety of baby animal species. Quite possibly one of the most beautiful picture books I've ever seen, the mandala like illustrations by Poonam Mistry are all worthy of framing and hanging on your wall. Chitra Soundar's words read like poetry and the voice of wise Mama Elephant is soothing and comforting as she reassures the frightened young ones that all is well. Just gorgeous. This book is illustrated with lush images in a style of traditional Indian art. Although the intricacies of the illustration are beautiful, I found it difficult to pick out the animals or other items mentioned in the text. I think some children might be distracted by the details of the illustration and not readily connect the images with the text. What an extraordinary book this is- in text and art. The lyrical, reassuring refrains, the familiar childlike worries about darkness and storms, and the hypnotically swirly image-within-images combine to comfort at bedtime and fascinate in the light of day. Art fans should spend time with this, too. I like how aspects of the weather such as thunder, wind and lightening are put in a context and would be a great book for children to read if they are scared or worried about thunder storms. However, I'm not sure I like the pictures as I find it hard to differentiate between the animals and environment. There is good use of colour. Oh, my! Mistry’s dazzling illustrations almost make the text unnecessary, and Soundar’s lovely bedtime tale would soothe an insomniac to sleep. Poetic, powerful, and just about perfect. A little more folklore-y than You're Snug With Me - some fantastically illustrated baby animals are comforted by Mama Elephant as she explains the benefits of the scary things in the world around them: lightning, the river, wind... Another feast for the eyes! Chitra Soundar is originally from the culturally colourful India where traditions, festivals and mythology are a way of life. After six great years in the island city-state Singapore, Chitra now lives in London. Chitra's primary interest is in writing picture books and early & emergent readers. She enjoys retelling funny folktales from around the world, especially from India.